So I finally made it out to Drago Centro. It was long overdue really, if you've seen me or talked to me lately...you know why. I was quite excited. It was a Monday, gloomy and I had school at 2:00 PM. But I had delayed this outing long enough. Bed headed and still groggy from yet another late night's debauchery, I showed up with a spray painted "Discocks" D.I.Y shirt and my tightest of fading 501's; the hostess pulled my seat for me to sit. I was here for the food man. But there is no such thing as an ordinary 'quick lunch' when certain people know you are a food enthusiast. Sooner than I knew it, an impromptu tasting menu of Ian Gresik's favorites, the chef di cucina at Drago Centro, was set to take place. Michael Shearin, Drago Centro's beverage director, came out and showed us the old cocktail list in addition to a sneak peek of their new spring cocktail list to be unveiled next Wednesday at 6PM for $6 each, look at website if interested. Only one drink was kept. Although I had to send back the first attempt due to wateriness, Michael showed me what's up with one he made himself. 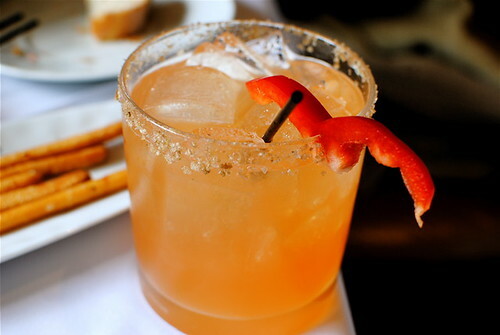 A unique sweetness was achieved with the sweet pepper boosted agave while the cilantro--in unison with the Sombra Mezcal's smoke profile--added a savory element. And that smoked salt only left you wanting more of smoky nectar. Italian for "Clockwork Orange"...this just might probably be the official mixed drink of The Glutster for now. Luscious: How Superlative Can A Pasta Get? 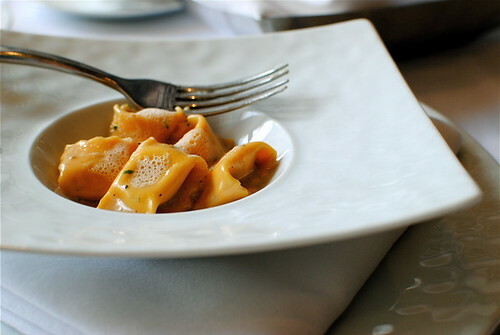 Agnolotti stuffed with a creamy Ricotta, and bathed in a truffle and fine-herb enhanced butter sauce. Each tender-to-the-bite little pillow literally exploded with molten cheesy goo. Sheer glee in every bite, the bar was set high with this. 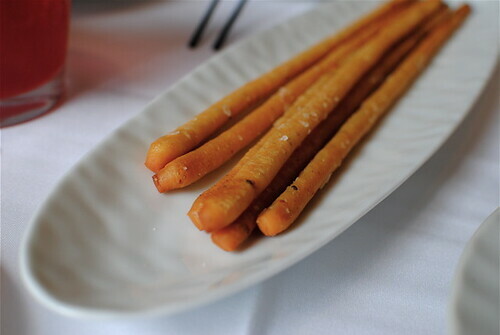 Some crispy bread sticks were brought out to the table by the pastry chef, flecked with kosher salt, my taste buds suspected some Parmesan action went into it. Hence the gourmet cheese-it addictiveness of them. I ate three in a minute. 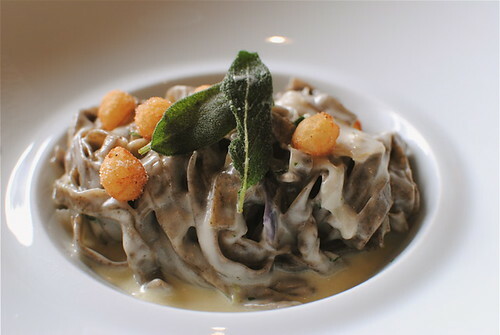 My first time having a Fettuccine-like and cream based dish in a long time, these chewy noodles were made with Buckwheat flour and was served with fried sage leaves, cooked cabbage, crispy potato ball things, lotsa Fontina and an underwhelming sage cream. 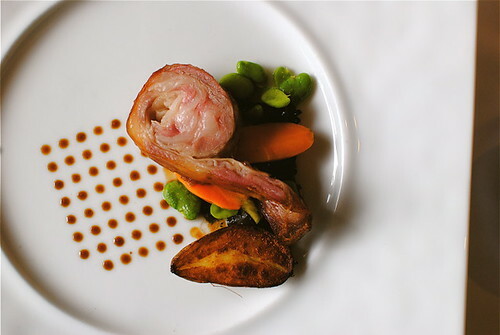 This dish definitely had potential to be outstanding, had everything going on: texture, appearance, portion. If my lunch mate and I didn't have to ask for some salt to make up for the kitchens under seasoning, nothing a couple pinches mended right up though. Crispy skinned with a gamy, sinewy bite that almost squeaks as you pleasurably chew it, this is what pork belly aspires to be. Served with those pretty dots that I think was some sort of balsamic reduction, shelled and buttered fava beans, some type of mushrooms and a crispy potato halves. I was pretty damn satiated. But the reason for me being here was dessert. 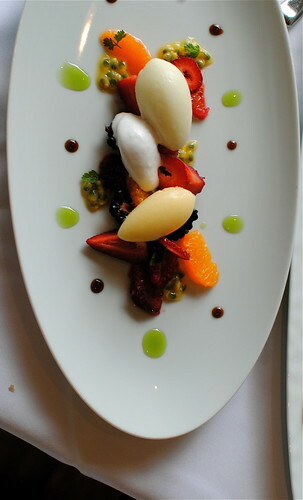 Harry's Strawberries, sweet raspberries, blackberries, blueberries, mandarin oranges, blood oranges, and ultra tart passion fruit seeds were polk-a-dotted with the classic balsamic reduction as well as a tantalizing aromatic basil syrup. The sorbets were tangelo, piña, and coconut and left me licking the edges of the spoon as I kept my dignity this one time and didn't lick the plate. There was something oddly complacent about the sudden mating of smooth, creamy avocado and the balmy, perfumed basil gelato, talk about sweeping me off my feet. La Torta Di Primavera's complexity in textures of spongy olive oil cake, crunchy homemade Campari candy and tart grapefruit segments came out of nowhere with its clean, fruity and strangely comfortable flavors. 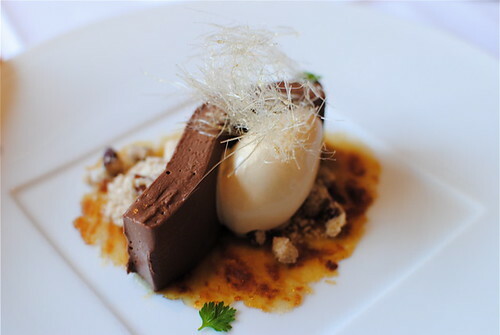 Keeping the decadence train going, the chocolate custard was smooth and luscious, the pecan crumbles and pulled sugar added that bomb signature texture contrast while the conceptually named date carpaccio was sweet and chewy. That caramel gelato with its burnt sugar decree only bounded it all together. By this point I was pretty much sweeted the hell out but I almost never will refuse MORE DESSERT. For the first time I actually opted for some coffee on the fact that Drago got a custom blend made from Lamill coffee. 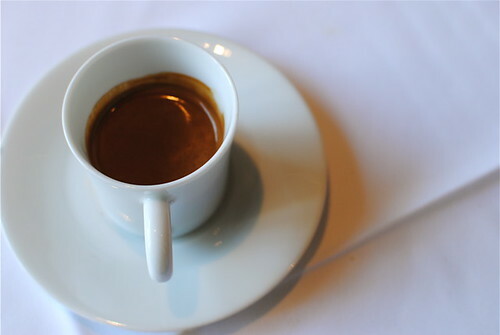 And after all that sweet fondling, a serving of their slightly long-pulled espresso hit the spot. Like an unforeseen sock in the face with its intense, bitter almost astringent qualities. I payed for the uber high caffeine content later though. Thanks to Jashmine Corpuz for making all this possible and being awesome. By the time the feast was over I realized my journalism class was about to start in ten minutes...all the way in Pasadena. Oh well, ditching school and many other "important" things in life for food is the story of my life. And I don't care really, when those experiences are worth it...like this. I hope you didn't miss anything important in class. You certainly got the hookup. Well deserved, of course. Those desserts look and sound worth missing class for. wow these pictures are gorgeous! 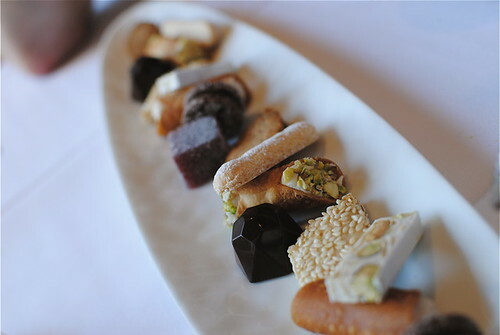 i wish i could have some of those desserts right now. (1) Love the "my type of lunch crowd" caption. 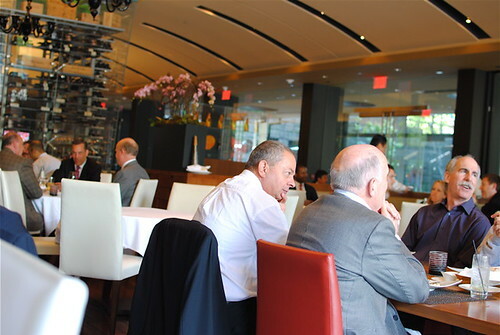 Now imagine that such a lunch crowd comprised the people with whom you worked...for six years. Ugh. (2) Love the dots under the lamb belly. I've never had lamb belly. Well, I don't think I have. (3) Love the photos. What camera are you using these days? Booya, I was waiting for the espresso at the end! Everything looks awesome! Lamb belly huh? That's different. What's a devotchka? 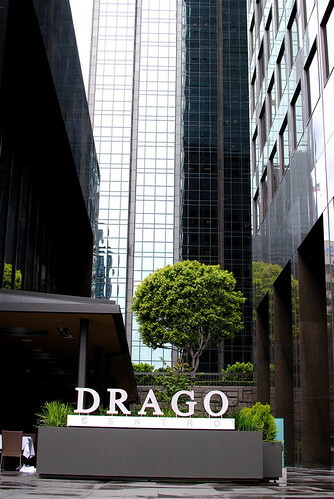 Unfortunately, I left LA without trying any of the Drago restaurants. I probably didn't give enough credit to Italian food when I was there. Nice. I haven't been back to Drago Centro since they first opened, and it looks like it's only getting better. And so are your photos. 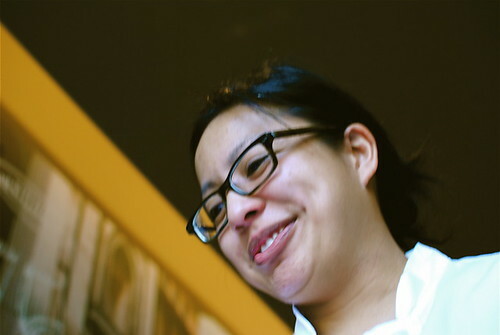 I just scrounged up all the Saveur money and got a Nikon D3000 (thanks to Matt for camera recs!). Russian word meaning "girl" or "woman," made popular by the 1971 classic A Clockwork Orange, and the all female punk band (hence the name), The Devotchkas.